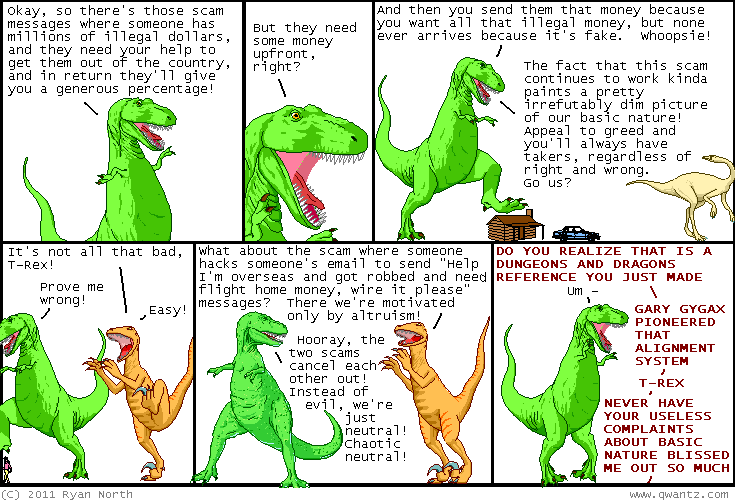 Dinosaur Comics - February 24th, 2011 - awesome fun times! –Anyway! With this in mind, I am going to become totally racist!! February 24th, 2011: If you want to donate to help the victims and survivors of the earthquake in New Zealand, the New Zealand Red Cross can help, but their site is struggling now. You can also use Give A Little to donate; they're sending 100% of the funds to the Red Cross there. In happier news, its rare that I get fan mail for linking to something, but when I linked to BoxCar2D I got emails thanking me for pointing it out! BoxCar2D is a site where your computer evolves a sweet car/motorcycle/8-wheeled conveyance, from scratch, using genetic algorithms. And there's a new version out today, and the cars are now breakable! ENJOY.